On 8 November 2000, the French Senate passed a resolution condemning and recognising the Armenian genocide. (2) This gave rise to mass hysteria in the Turkish press. Even Doğu Perinçek’s Aydιnlιk joined in imagining European and American conspiracies to break up Turkey. (3) A former Maoist, and now a staunch Kemalist, Perinçek epitomises the journey of the Turkish left towards nationalism. With some exceptions, there seem to be a convergence between the left and the right in Turkey on such issues as the genocide. Both political spheres use such terms as “sözde soykirim” (“so-called genocide”) to deny the genocide against the Armenians and display a crude nationalism. This makes it very difficult for anyone to raise the issue of the genocide from a divergent perspective, as the combined forces of opposition are very strong. During September and October 2000, the US Senate was also discussing a resolution on the genocide, which eventually did not pass. It was not clear at the time whether the resolution was going to be adopted. (4) Nevertheless, Turkish newspapers felt obliged to print another volume of articles attacking Armenians and any other ethnic group or institution viewed as suspicious. One such paper, Olay, went to extract a statement from an Assyrian priest, Yusuf Akbulut. The first suspicious factor is why they chose to go to obtain a statement from a priest with a very small congregation in Diyarbakir(5), when they could have spoken to religious leaders in Tur’Abdin or Istanbul. The following day two journalists from the populist tabloid Hürriyet went to confirm Father Akbulut's statement. Next day the vilification campaign started in earnest against the priest. Hürriyet called him a ‘traitor’ (hain). (10) This is a charge worth analysing. It is certain that what Hürriyet means is ‘a traitor to the Turkish nation’. However, Father Akbulut is not a Turk, although a Turkish citizen. He is a Syriac Orthodox, a Syriani; member of a dwindling minority. One could argue that were he to deny that the genocide took place, he would have been a traitor to his own nation. Under the circumstances, however, nobody would have blamed him, had he simply issued a denial of the genocide for fear of his own and his family’s safety. The underlying message in the Turkish press is that everyone who lives in Turkey owes gratitude to the Turkish government, state and the nation. If they do not show this gratitude in some way, they would be considered as traitors. Elsewhere I have discussed the policies of the Turkish Republic on ethnic minorities, and the Assyrians in particular(11), and it is not necessary to repeat them here. The precarious state of the Syriac Assyrian people in Turkey is even occasionally accepted by the Turkish press – that is when they are not running campaigns against them. (12) Nevertheless, it is important to refer to a number of documents that would place the current situation of the Syrianis in the relevant context. A Syriac Church petition to the Turkish government of 1995 with clarity and great care puts the insecure position of the Syriani community to the Turkish government. (13) The letter is signed by Timotheos Samuel Aktaş, Archbishop of Tur’Abdin, and Filuksinos Yusuf Çetin, Archbishop of Istanbul and Ankara. The letter was addressed to the Office of the Presidency. An administrative order was to be given to the local governor (Vali) to respond to the petition, yet it was not followed up. (14)It is perhaps to this state, which does not even bother responding to a letter written by an ethnic community leader, that Yusuf Akbulut is supposed to show gratitude. This petition refers to Articles 37 to 45 of the Lausanne Treaty (1923) on the protection of minorities in Turkey. A cursory examination of the said articles will reveal that the conditions to which the Turkish government agreed were mostly honoured in their breach rather than their implementation. For example, Article 41 purports to grant the right to non-Muslims to use their language as a medium of communication in primary schools. Yet, Syriani Assyrians are not able to exercise that right. In Article 38, the Turkish government undertakes to assure full and complete protection of life and liberty to all inhabitants of Turkey without distinction of birth, nationality, race or religion. Yet, between 1990 and 1994, 27 Assyrians were killed systematically in Tur’Abdin area, most probably by fundamentalist Muslims, without attracting the attention of the Turkish authorities. Partially, Article 40 grants religious freedom, yet as Archbishop Aktaş indicates in his petition, holy books in Syriac (Aramaic, Chaldean) imported to Turkey are being seized by the authorities. The Turkish authorities prefer not to view the Syriani community as a minority. The objective of this policy is to deny any special rights to the Syriani Assyrian community. (15) A further evidence of this is the communiqué sent by the Legal Adviser of the Ministry of Education who somewhat nonsensically state “… the Syrianis are not a minority in Turkey. And if they were a minority, since they would study in their own schools, they would not have the problem they claim to have”. The Lausanne Treaty, which was signed by all concerned in good faith, has been used against the Syriani community and provided no protection for them. The Rule of Law is supposed to afford them that protection, and yet various laws and regulations have been used to intimidate further a small minority. Yusuf Akbulut’s predicament is a case in point. In most countries where religious freedom and the right to free speech is observed, Father Akbulut’s comments would at most raise an eyebrow. Yet, the full extent of the power of the law descended upon him, on the grounds of an article written by two ‘patriotic journalists’ from the tabloid press. Father Akbulut was thoroughly vilified in Hürriyet and other press. Hürriyet, which was obviously not satisfied with the label ‘traitor’, also published an article by vilifying all priests, merely by the title of its article: Süryani Papaz ‘papaz’ oldu. This is somewhat difficult to translate, but roughly, it can be rendered as “the Syriani priest became a ‘priest’”. The second term ‘priest’ is used as an insulting phrase. That is, a ‘priest’ demonstrates some negative qualities, which are nevertheless not defined. This is the message of this title. It is encoded, and any reader trained by tabloid press would receive the message as such. Perhaps father Akbulut should have shown gratitude in a country where newspapers uses the designation of his profession as an insult. The use of such language in the Turkish press referring to Greeks, Armenians, Assyrians or Kurdish is not unusual. For example, at the same time, another Turkish paper, Star in their reference to the recognition of genocide in Europe, set the following sub-heading: “Ermeniler azdi”. (17) “Armenians got out of hand” is one possible translation, but it has even more negative nuance in Turkish. Once again, the message is that the minorities should live within the narrow confines of the paradigm set by the policies of the Turkish state. If they do not, repercussions will follow. Even the Germans were not spared the ire of the Turkish press. A Turkish tabloid Takvim labelled he German parliamentarians slanderers” and demanded to “make the slanderers shut up!”(18), though suggested no cause of action to achieve such an objective. The statements of Yusuf Akbulut, as reported in the press, have not gone unnoticed by the Public Prosecutors’ office and the security forces. Yusuf Akbulut was arrested, then released but then charged under the notorious Article 312 of the Turkish Penal Code (Türk Ceza Kanunu, TCK). (19) This article warrants some attention because the circumstances in which Father Akbulut found himself cannot be understood without reference to the rationale behind such law. Whoever openly praises or speaks favourably of an action which, by law, is a felony, or who incites people to disobey laws, shall be punished by between six months’ and two years’ imprisonment and shall be subject to a heavy fine of between 6,000 and 30,000 Turkish liras. In its application, ‘ethnic propaganda’ is considered to provoke such enmity and is therefore punished. However, any expression of ethnic, religious, national, confessional identity may be considered such propaganda. Many journalists, intellectuals, publishers and politicians have been charged under this act. Although the article has mainly been used against the Kurds, Turkish journalists and Islamists have also been charged under this act; for example, former leader of the Islamist party Refah Partisi (Welfare Party) Necmettin Erbakan, and former Mayor of Istanbul Recep Tayyin Erdoğan. Consequently, the Islamists are in favour of abolishing it. (21) The most noteworthy cases, not involving fundamentalists, have been those of Şanar Yurdatapan, Yaşar Kemal and Turkey’s Human Rights Association President Akin Birdal. For the purposes of this paper, the charges brought against the Islamists do not concern us because the cases are quite different. However, some cases warrant our attention, which may be relevant to the case of Father Yusuf Akbulut. Şanar Yurdatapan was charged under Article 312, for distributing an abriged version of his book Freedom of Expression. In this instance, the court showed a reluctance, which by no means is isolated, to impose a prison sentence, and preferred to enforce a fine of 650,000 TL (US$6.50 at the time). The Articles 312 is supposedly against incitement of hatred on racial grounds. However, in practice, I argue that its true intent is not that. It is an article aiming to suppress any kind of criticism of the Turkish state, emanating from the ethnic minorities or anyone on behalf of the ethnic minorities. It is to protect the Turkish nation, the majority, from the minority. Whereas in the reverse, the article provides no protection to the minority. For example, Armenians are routinely vilified in the press but no action is taken against journalist inciting hatred. Yusuf Akbulut was vilified in the press but no action was taken against journalists. In fact, the three journalists were state witnesses against Yusuf Akbulut. In most countries, vilification legislations are in place to protect the minorities from the majority. (25) In Turkey, it seeks to prevent minorities from asking for their democratic rights. Reportedly, some judges examine evidence rigorously and dismiss many charges brought under these laws. Thus an enthusiastic public prosecutor may not necessary secure a conviction. DGMs predominantly hear cases under Anti-Terror Law and Section 312 of TCK. The courts may admit testimony being obtained during police interrogation in the absence of counsel. While by law the Bar Association must provide free counsel to those who cannot afford a lawyer, this is not the case for DGMs. Father Yusuf Akbulut found himself in a difficult position. One can imagine the difficulties in being the sole priest in the only church of a small congregation in Diyarbakir. This seems to be the fate of the Christian Minorities in Turkey. A lone priest marking the end of a civilisation that lasted for millennia in that land. The reduced number so of an ethnic community, however, is one sad factor. More sinister is the way the Turkish government tries to undermine even this small group of indigenous Anatolians. While Armenians have in the past very regularly received negative publication in the Turkish press, the Assyrians were treated more sympathetically by the press, including Hürriyet. However, this sympathy evaporates once some establish official truths are undermined. A member of a minority is supposed to show gratitude for being allowed to live in such a tolerant society. He or she is not supposed to step out of line, as Yusuf Akbulut did. He did not even criticise the current government policies on ethnic minorities. He simply pointed out what he believed to be a fact. Surprisingly, the judge acquitted Akbulut of the charges. He did not even impose a monetary fine. In the current political climate where Turkey is at the gates of Europe, the judge did not seem to want to impose a sentence at all. It would have only served those who may say, “Turkey is not a democratic society, and here is one more proof”. Furthermore, a priest imprisoned for simply expressing his opinion may not have been looked favourably upon by the European Union, where Turkey is seeking membership. A prison sentence would have certainly looked like an over-reaction by the Turkish State. As Barbara Baker reported, Akbulut’s lawyer argued that the journalists acted unethically and that he talked to journalists “off the record”. This is crucial, as private comments do not come within the purview of Article 312. The public prosecutor himself asked the court to acquit Akbulut. (33) This was the same prosecutor who initiated the case when he read the article in Hürriyet. In the last hearing, the prosecutor said that Akbulut did not “behave with a special intention to incite people to hatred and enmity” and that “his behaviour be evaluated within the framework of freedom of expression”. The inevitable question emerges, as to why he initiated the case at all? There are a number of conclusions that can be drawn from the Akbulut case. While the case was in progress a report on the Assyrians was presented to the State Security Council. The compilation of “the Assyrian report” – a report on the activities of the Assyrian Diaspora -(34) was almost certainly precipitated by the publicity the Akbulut case attracted. It may also partly account for the recent circular issued by the Turkish Prime Minister Bülent Ecevit on Assyrians (Appendix B). 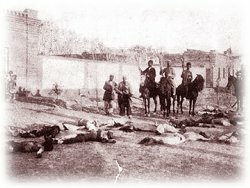 The Turkish government must have realised that the traditional methods of denialism may not be sufficient to neutralise claims of Assyrian Genocide. The Assyrian Diaspora demonstrated its skills in mastering support for Akbulut and it is unlikely that the momentum will be arrested until Turkey recognises the Assyrian – indeed the Christian Genocide of 1915. Furthermore, the State Security Council’s report illustrated that various authorities - covert and otherwise, watch the Assyrian activities. ACCUSED : YUSUF AKBULUT, son of Lehdo and Meryem, born in 1964, registered in Ana Street, Lalebey district of Midyat, Priest of Our Lady Church. OFFENCE : Inciting people to hatred and enmity by referring to religious, racial, sectarian and regional differences. Then person whose identity is stated above, the accused Yusuf Akbulut, who as a priest of the Syriani Our Lady Church, in an interview he gave to Star newspaper Diyarbakir correspondent Halit Ziya ALPTEKIN, and Olay newspaper correspondent Ahmet BESENK on the day of committal of the offence, referring to the so-called Armenian Genocide Resolution said "At that time it was not only the Armenians but also the Syrianis who were massacred, on the grounds that they were Christians. Christians were massacred in groups, the Kurds were used in the massacres … The homeland of the Syrianis is Mesopotamia. Whereas the Armenians is Mus, Erzurum, Van, Erzincan and Sivas. Armenians lived in these lands. Why is that they were so many Armenians then and now there are not any? In our area, it is called the "kafle time". What does kafle mean? It means destruction en mass. All people living in the region know the truth… I look at Diyarbakir, many people say my grandmother is Armenian or Syriani. From this we understand that at that period our men have been massacred but our young girls were not touched". Furthermore, he also said that he supports the so-called Armenian Genocide Resolution. When the interview was published in Olay newspaper on 03.10.2000, Hurriyet's correspondent Ayhan Acet went to see the accused for confirmation. The accused verified his statement and the interview was published in Hurriyet, on 04.10.2000. In this manner, the accused committed the crime of openly provoking and inciting people to hatred and enmity by referring to religious, racial, sectarian and regional differences. As is understood from Hurriyet and Olay newspapers, Case Report and Confrontation Reports, witness statements by Ayhan ACET, Halit Ziya ALPTEKIN and Ahmet BESENK, and a recorded video cassette 2000/500concerning the interviews. It is alleged and requested that in the name of the public the accused be tried promptly in accordance to procedures of No 2845 Law and the appropriate article. Turkish citizens of Assyrian origin who emigrated abroad on their own will as a consequence of intense terrorist activities in their region have reportedly been facing certain difficulties in returning to their homes in Turkey. It has also been claimed that they encountered certain restrictions in their efforts to return to their villages in exercising their real property rights and in visiting their relatives. It was also reported that they were not allowed to receive religious education and that foreigners were prevented from visiting Assyrian villages. Certain administrative errors may have been made due to misinterpretations at local level. However, instructions have been given to the local authorities to act within the law. Constitutional, legal and democratic rights of all Turkish citizens of Assyrian origin are under the full guarantee of the State. Our dear citizens who have settled in other countries for various reasons can return to our country and their villages without any difficulty or restrictions. I am indebted to Dr Gabriele Yonan for providing information and inspiration for the article. ‘French Senate Recognizes 1915 Armenian Genocide’ at https://www.atour.com/~aahgn. On May 29, 1998, the French Lower House had already adopted a similar resolution. D.Perinçek, “‘Ermeni soykirimi’ sopasinin ‘kutsalliği’, [The Sanctity of the ‘Armenian genocide’ stick], Aydinlik, 12 November 2000. Eventually, on 19 October, the US Congress decided it was against US interest to proceed with the resolution; HR 956, The Armenian Genocide Resolution. ‘La grand peur des Arméniens de Turquie’, [The great fear of Armenians in Turkey], Nouvelle d’Armenie en ligne, 20 November 2000. The most authoritative work in the field of Assyrian Genocide, which proves beyond doubt the validity of the Assyrian assertions, is Gabriele Yonan’s Asur Soykirimi: Unutulan bir Holocaust [Assyrian Genocide: a Forgotten Holocaust], İstanbul, 1996. R.Yavuz, ‘İçimizdeki hain’, [Traitor in our midst], Hürriyet, 4 November 2000. R.Donef, ‘Assyrians in Turkey: Disappearance of a culture?’, Assyrian Australian Academic Journal, 2000; R.Donef, ‘The Assyrians and Assyrian Identity in the Turkish Republic’, Persecution of Syriac-Speaking Christians Conference, Macquarie University, 2 July 2000. For example see Ş.Ç.Nusaybin, ‘Süryaniler göçüyor’, [Syrianis are migrating], Hürriyet, 12 July 1999. See Suryoyo Online News, https://www.gwdg.de/~grabo/news/aktas-cetin-tr.htm. Unfortunately the introduction of this letter has been omitted in this source and thus it is cited here: “Whether we accept the Syrianis as coming from Aramaic or from Assyrian roots, we can say that they are a community coming from the Semitic race which has lived and is living in Mesopotamia. The Syrianis are called by many names, according to their beliefs, the regions they inhabit, and their specific ethnic roots: Aramaic, Assyrian, Chaldean, Nestorian, and Maronite”. Letter from Archbishop Samuel Aktaş to German Embassy in Ankara, 9 February 1996. A. Carleton A., The Millet System for the Government of Minorities in the Ottoman Empire, Ph.D. thesis, Hartford Seminary Foundation, 1937, p.149. ‘Sali Saldirisi’, [The Tuesday Assault], Star, 7 October 2000. ‘Priest awaits trial for holocaust acknowledgment’, https://www.aina.org. R.Yavuz, ‘Turistlerin önünde Papaza gözalti’, [Priest arrested in front of tourists], 6 October, 2000. ‘Tartιşmali TCK 312 ve 313’, [The controversial Articles 312 and 313], Nethaber, 27 November 2000. ‘312 hemen değişmeli’, [312 should change immediately], Yeni Şafak, 10 July 2000. U.S. Department of State, Turkey: Country Reports on Human Rights Practices for 1996, 30 January 1997. It should be added Belge Yayinlari has often given platform to Greek, Armenian and Kurdish authors, including the Turkish Kurdologist Ismail Beşikçi. R.Zarakolu, “Milli Çikar Meselesi”, [A matter of National Interest], Yeni Gündem, 26 October 2000. For example, see Australian legislation of racial vilification on both Federal and state level. It should be noted, however, that these law provide civil remedy only; they are not part of the criminal code. ‘Government sends human rights leader back to prison, Human Rights Watch, 29 March 2000. ‘Government sends human rights leader back to prison’, Human Rights Watch, 29 March 2000. 95% of the Turkish population is also in favour of changing Article 312; See https://www.kanal7.com/anket/anketsonuc.htm. U.S. Department of State, Turkey, Country Report on Human Rights Practices for 1998. 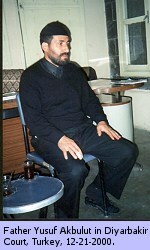 B.G.Baker, ‘Syrian Orthodox Priest Acquitted in Diyarbakir trial, Compass Direct, 5 April 2001. See Donef R., ‘Turkish National Security Council's report on the Assyrians’, www.atour.com, 21 March 2000. For further information on legal aspects of the case see Sweden’s Parliament Discusses Akbulut’s Pending Trial, Zinda, 20 December 2000; Also see translated transcript of the conversation between Gabriel Afram from Assyrian/Suryoyo Qolo Radio Program and Abdil Kadir Pakdemir, Fr. Yusuf Akbulut’s solicitor; at https://www.bethsuryoyo.com. N. Durukan, ‘Beraat’, [Acquittal], Hürriyet, 6 April 2001. Dr Gabriele Yonan publicly presented a copy of the Turkish translation of her book on the Assyrian Genocide to the Public Prosecutor, who accepted it with no qualms. This happened during the second hearing. ‘Kürt tehlike, Asuri ve Ermeni değil’, [The Kurds are a danger not the Assyrians and the Armenians! ], Özgür Politika, 6 April 2001.